who insists between Lake Garda and Lake Idro, it is bounded to the west by the mountains and Vesta and Stino from which it takes its name and to the north by the high peaks of Mount Cingla, Top Tombea and Monte Caplone. 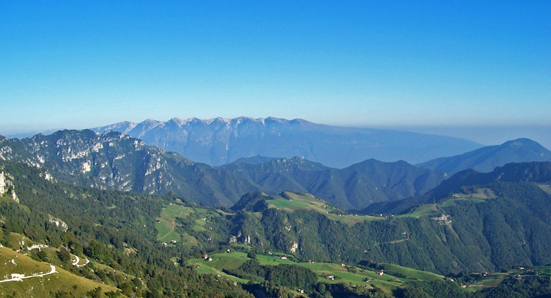 This valley is administratively divided into two areas: Valvestino and Magasa. Valvestino is composed of five villages and is located between the Valley Sabbia and Lake Garda, is behind the Riviera dei Limoni. The city hall is located in the country of Turano. Its territory includes the northern part of Lake Valvestino, an artificial lake created in 1960 with the waters of the river Toscolano. The name Valvestino has probably originated in the name of Vesta and Stino Mountains which surround this area closing to the southwest. Already in prehistoric lands of the mountain Valvestino were visited and settled first by Stoni, euganeo people, then by the Etruscans, Gauls Cenomani and later by the Romans, who founded the village. At the end of the Roman Empire The valley was invaded by barbarians, as soon settled the Longobards, whose passage still leaves traces in the way of cover with wheat straw the rustic buildings at Cima Rest (Magasa). Following the Lombard era lasted for six centuries the domain of the Counts Lodron: the beginning of the eleventh century to 1805 the valley was in fact fief of the German Empire (then assigned to the Prince of Trento and Conti Lodron) subjected to thirty administration. The condition of isolation given by pivotal role between the Hapsburg Empire and the Republic of Venice, along with the difficult roads in the valley, made a must choice of subsistence farming and livestock or alternatively emigration . The villages in the valley were then subjected to the Empire of Austria-Hungary, whose ancient border was marked by the river Droanello, if still there is a plaque bearing witness to that fact. The beginning of the Great War in 1915 and the clash between Italy and Austria lead to the annexation of Trentino and Alto Adige in Italian territory and autonomy of the towns of the valley until 1928, when they went to form the “City of Turano” in 1931 became “City of Valvestino”. The territory depended on Trent until 1934, when it was annexed to the province of Brescia. Great progress in terms of traffic characterized the 70s of the twentieth century, making possible even suggestive routes for tourists, in the car, by bike or motorbike, in these mountains and along the way between Lake Garda and Lake Idro. The unspoilt natural heritage and landscape is precisely the result of historical events and the geographical location that have preserved intact these lands of Valvestino.